Congratulations to Emilie Hujet, the winner of the 2019 Robert W. Hiller Scholarship, a scholarship established through the Wisconsin Bakers Association (WBA). 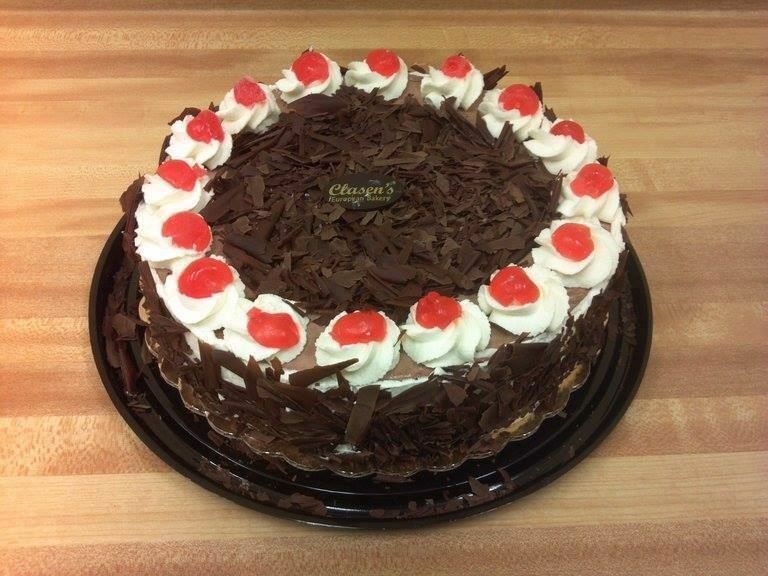 This year marks the fifteenth year the award has been given to a student studying in the area of baking/pastry arts. The scholarship was presented to Hujet at the WBA’s annual awards night on March 11, 2019. Hujet currently attends Fox Valley Technical College. In her essay for the scholarship, she wrote, “When I left the corporate world to pursue culinary school my ultimate goal was to become a Pastry Chef. 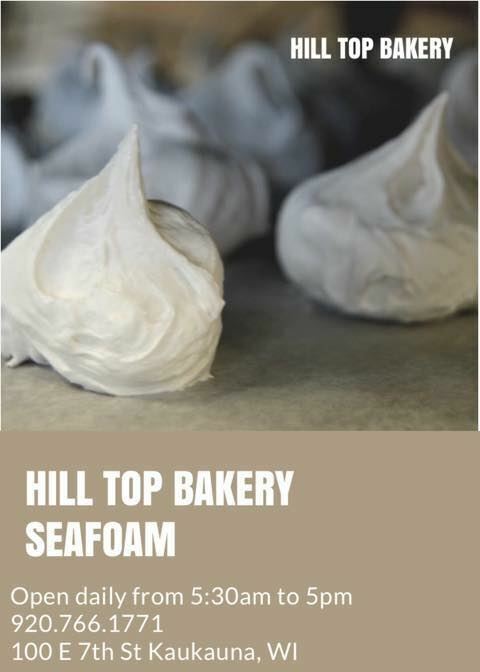 I have worked in a pizza restaurant, fine dining, a tap house, and most recently a gastro pub and still find that baking makes me feel the most alive, inspired, and most connected to people." 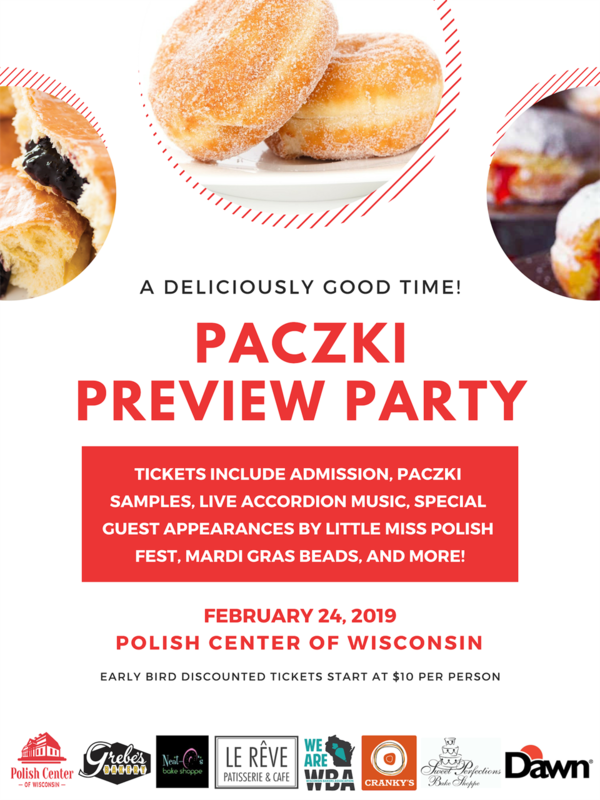 She added, "My future goals include a pastry food truck, and then ultimately a physical location featuring simple, yet developed flavors, beautifully detailed pastries, and a place where my future children can grow up. I want to be able to make people happy with my food, I want you to feel like you’re coming home when you have a dessert that I make, as if your mom or grandma made it, but with a modern twist." Two WBA Members from the Education Committee interviewed the finalists for this year’s scholarship along with WBA's Executive Director, Jessica Hoover. Tony Nieto of Neato’s Bake Shoppe in Baraboo, WI and Ken Heil of Sweet Perfections Bake Shoppe in Waukesha, WI selected Hujet as this year’s winner and also presented her with the award. The Robert W. Hiller Scholarship Fund was established on Nov. 5, 2000, to support and encourage people who have demonstrated a passion for a profession in the baking/pastry arts field. A $1,000 scholarship is awarded to the applicant who can best demonstrate this career commitment. The program intends to provide a financial resource for the education of students who will be the future of the baking industry. 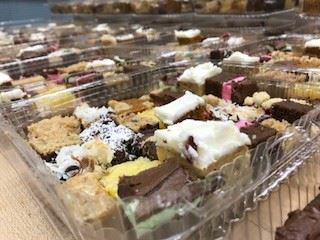 During the Wisconsin Bakers Association’s (WBA) Spring Board Meeting held at the Midwest Foodservice Expo on March 12, 2019, the WBA Board of Directors approved a new slate of officers. The WBA would like to announce its 2019 Board of Directors. 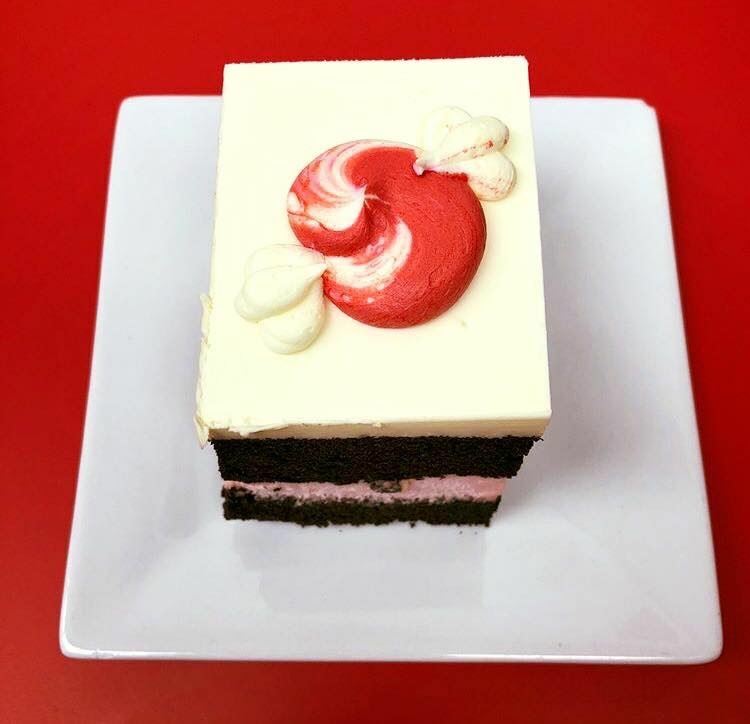 Continuing to serve as WBA’s Vice President is Tony Nieto – Neat-O’s Bake Shoppe, Baraboo, WI. WBA looks forward to the leadership and guidance of the incoming officers and directors. The leaders serving on the WBA Board of Directors are excellent ambassadors for both the association and the baking industry in Wisconsin. We hope you will join us in welcoming WBA’s new Board of Directors! 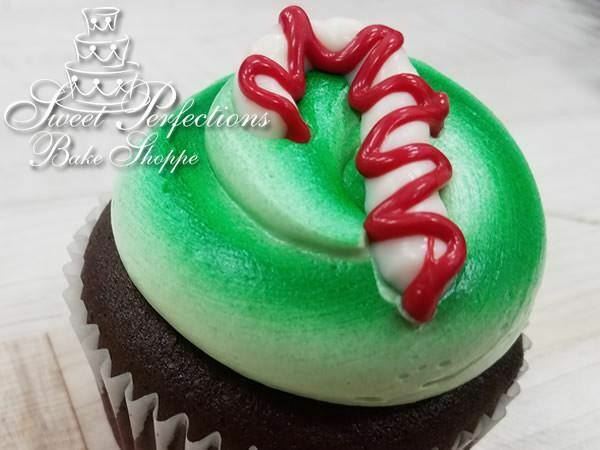 we are featuring other Holiday Specialties! 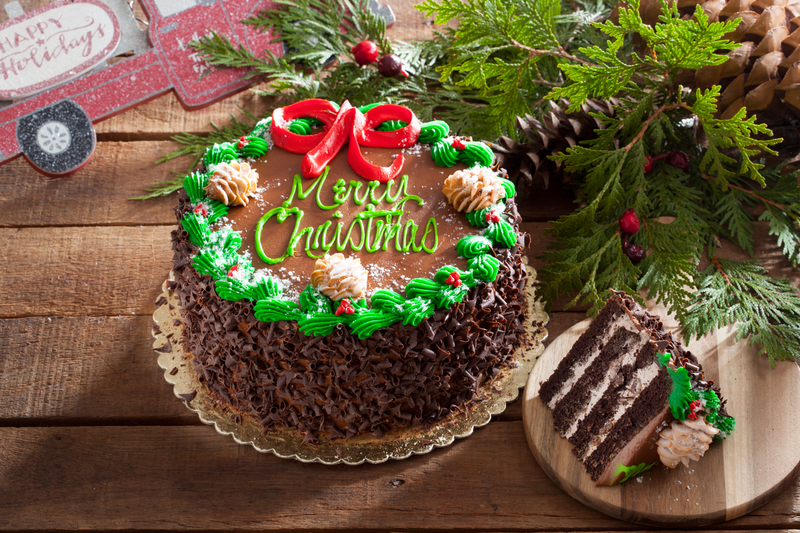 We hope you have enjoyed our 12 Days of Christmas Desserts. 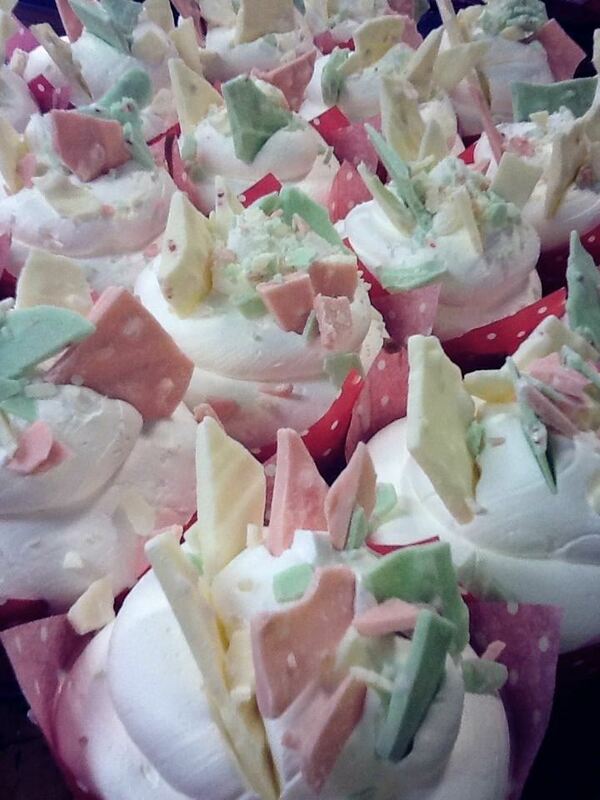 Here are just a few more to tempt your sweet tooth! 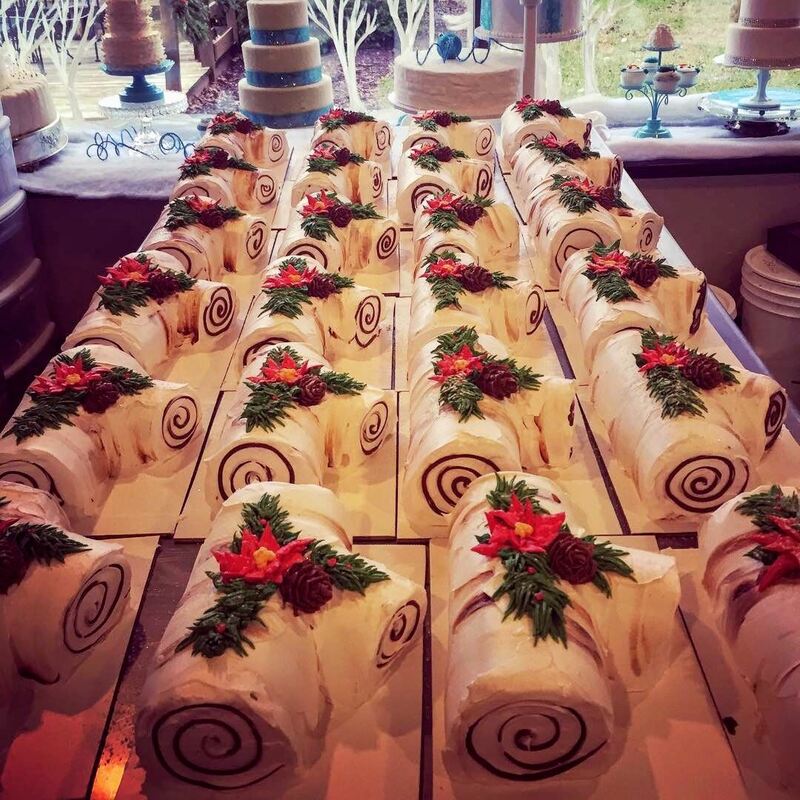 Wisconsin has a rich history where the kringle is involved and Wisconsin’s bakers know it! While it’s delicious all year round, the holiday season is the perfect time to celebrate this tasty pastry. 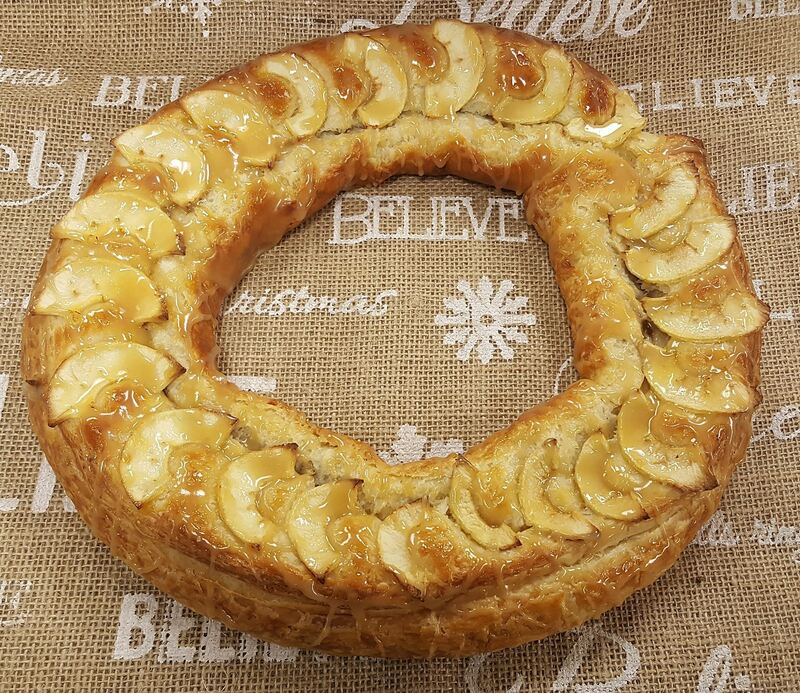 An authentic Danish kringle has 32 layers of flaky dough filled with variety of fruit and/or nut fillings. A kringle is made by repeatedly folding together butter and flour, then refrigerating the dough which produces the delicate, flaky texture. Kringles were first created by Austrian bakers who introduced their method of rolling butter between layers of yeast dough and letting it rest for hours before baking. When Danish bakers in Copenhagen went on strike in 1850, the bakery owners fired them and hired replacements from Austria. Once the Danish bakers returned to their jobs, they continued to make dough the Austrian way. Originally, kringles were baked in a pretzel shape in Denmark; therefore, outside every bakery in Denmark, you will find a sign with a kringle on it. As legend tells, the reason for this symbol was because when Vienna was besieged by the Turkish Ottoman armies in 1529, local bakers working in the night, gave the city an early warning of the attacking enemy. For this, they were later rewarded by the Pope, with permission to use a crown as part of their kringle guild symbol. For unknown reasons, the guild in Denmark is now the only baker's guild in the world with official authority to display a royal crown as part of their baker's guild trade symbol. 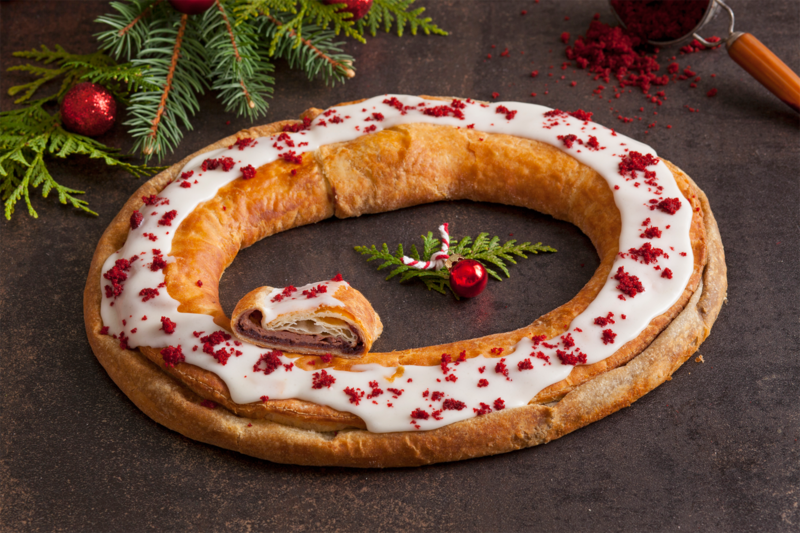 The kringle recipe was brought over to the United States by Danish immigrants in the late 1800’s. American kringles are hand-rolled from Danish pastry dough that has been rested overnight before shaping, filling, and baking. Many sheets of the flaky dough are layered, then shaped. After filling with fruit, nut, or other flavor combinations, the pastry is baked and iced. The Kringle became the Official State Pastry of Wisconsin in 2013. Racine, Wisconsin has historically been a center of Danish-American culture and kringle making. Many bakers in America adopted the easy-to-serve oval shape instead of the traditional pretzel shape; the oval shape allowed for the kringle to contain more delicious filling! With 32 flaky layers packed with flavor, you’re sure to add the kringle to your list of holiday must-haves. 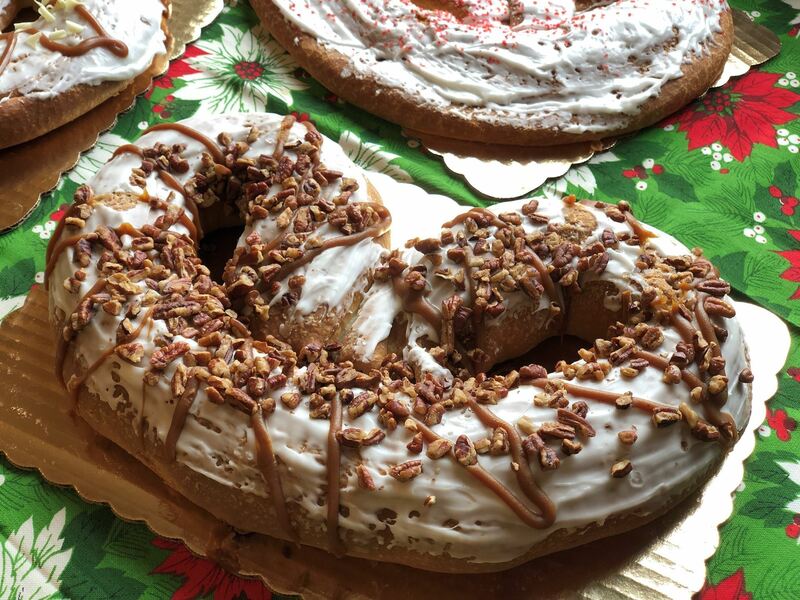 After all, the kringle has a special place in Wisconsin’s heart. 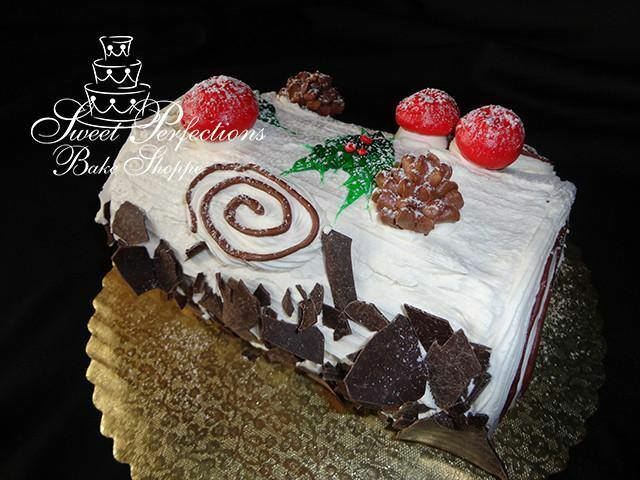 we are featuring Yule Logs! 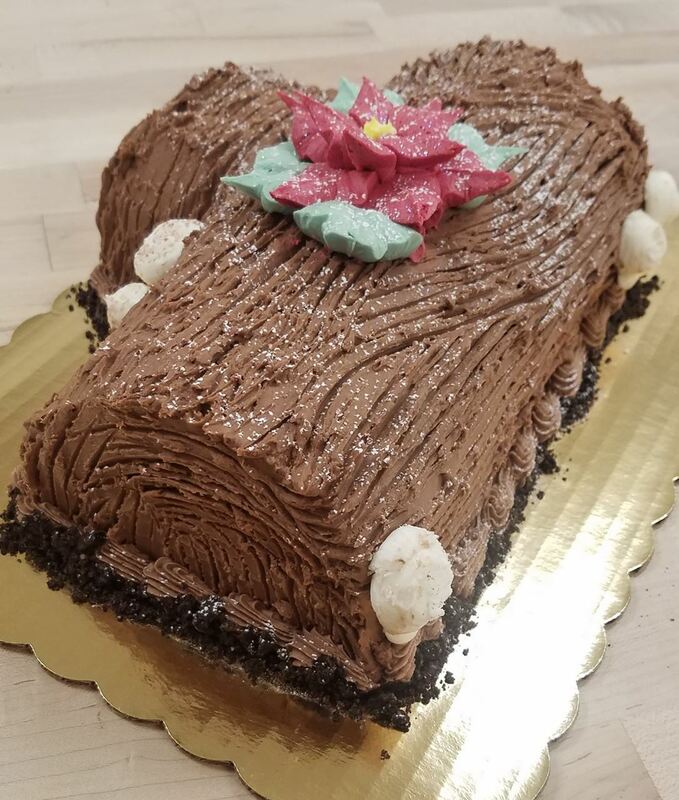 The Yule Log cake or the Bûche de Noël for you French speakers, is a classic French Christmas dessert used to symbolize a tradition that goes back centuries. 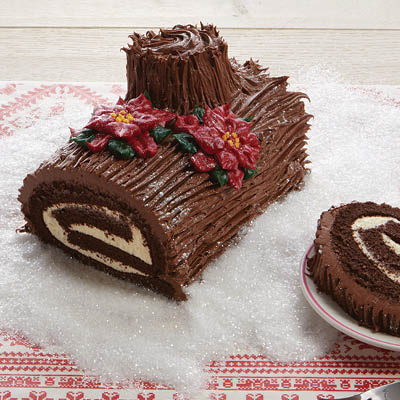 The yule log cake consists of a rolled, filled sponge cake, covered with rich chocolate frosting to resemble tree bark. 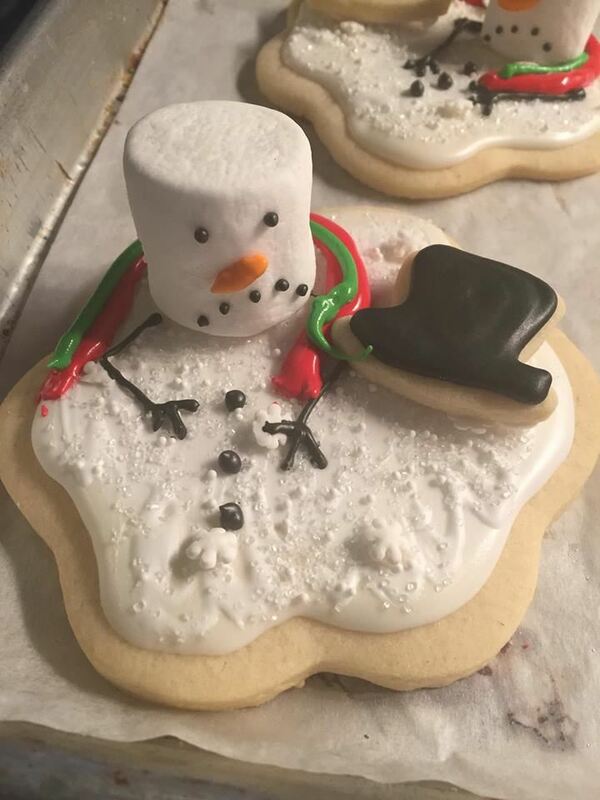 They are then often decorated with powdered sugar, meant to look like snow, meringue or marzipan mushrooms, fresh berries, and any other sort of edible decoration to complete the look of a freshly chopped log. The custom of burning the Yule Log goes back to before medieval times during Europe’s Iron Age. The word “yule” was the name of the old Winter Solstice festivals in Scandinavia and other parts of northern Europe. During that time, Celtic Brits and Gaelic Europeans would celebrate the Winter Solstice and the days finally becoming longer, signaling the end of winter. Originally, the Yule Log was an entire tree that was carefully chosen and brought into the house. The burning of the log symbolized the cleansing of the previous year and the ushering in of the new spring. The largest end of the log would be placed into the fire while the rest of the tree stuck out into the room. Once the log was burned, the ashes were considered valuable because they contained medicinal benefits and would guard against evil. Some kept the ashes inside their houses because they believed it would protect the house from lightning, which was important during a time when houses were mostly made of wood. The custom of the Yule Log spread all over Europe and different types of wood are used in different regions. In England, oak is traditional; in Scotland, birch was used; while in France, cherry was the tree of choice. Of course, soon hearths became smaller, so the logs did too. In some cases, different chemicals (like those found in wine and salt) would be sprinkled on the wood to create different colored flames when the log was burned. While it’s hard to pinpoint exactly when the first yule log cake was created, but based on the ingredients, it could’ve been as early as the 17th century. However, it wasn’t until the 19th century that Parisian bakers popularized the cake, and different bakeries became known for their more elaborate and elegant decorations. 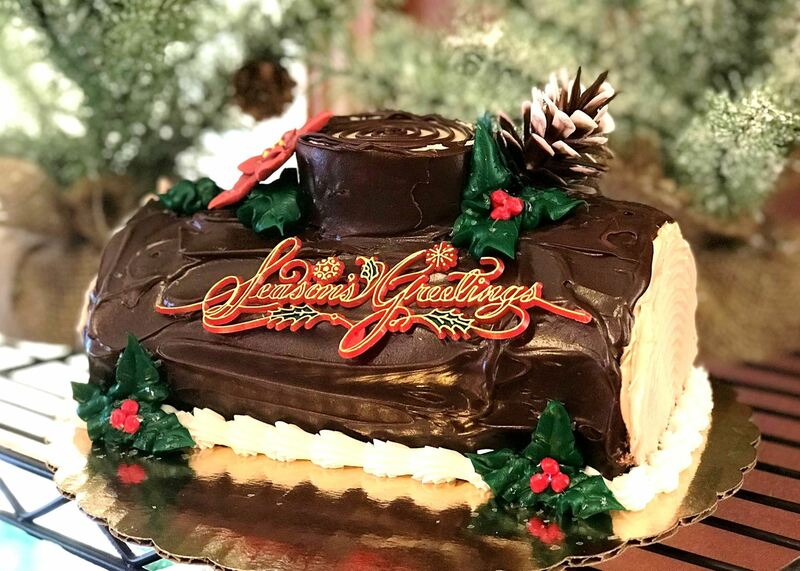 It is believed that the cake was created to symbolize the yule log tradition in places like Paris where burning a yule log wasn’t practical because of the lack of large fireplaces in the crammed city apartments. 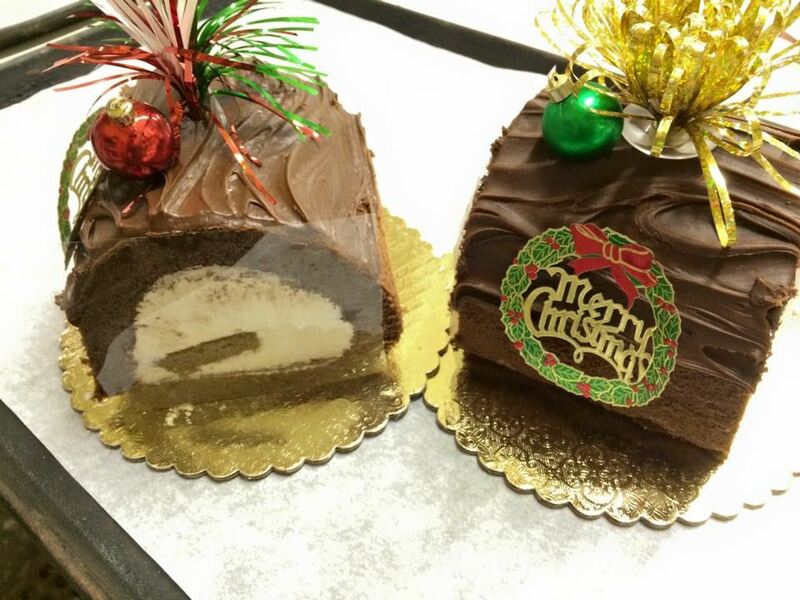 While yule log cakes aren’t as popular today, they are still a favorite Christmas dessert in many households and a favorite for bakeries to display in their storefronts this time of year. So celebrate the holidays and the welcome in the New Year with this symbolic and tasty tradition! We guarantee yule love it! 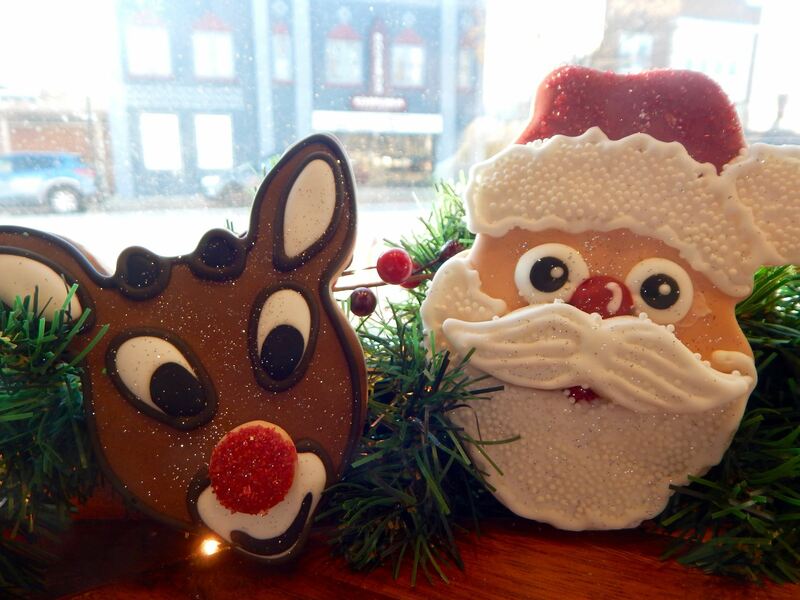 we are featuring Christmas Cookies! From Peanut Butter Blossoms to rosettes, decorated cut-outs to sprinkled spritz, spread some holiday cheer this year with Christmas cookies! Whether they’re for a cookie exchange or for Santa, cookies are perhaps the most loved of holiday desserts because they are quick and easy to make and are loved by even the pickiest of eaters. 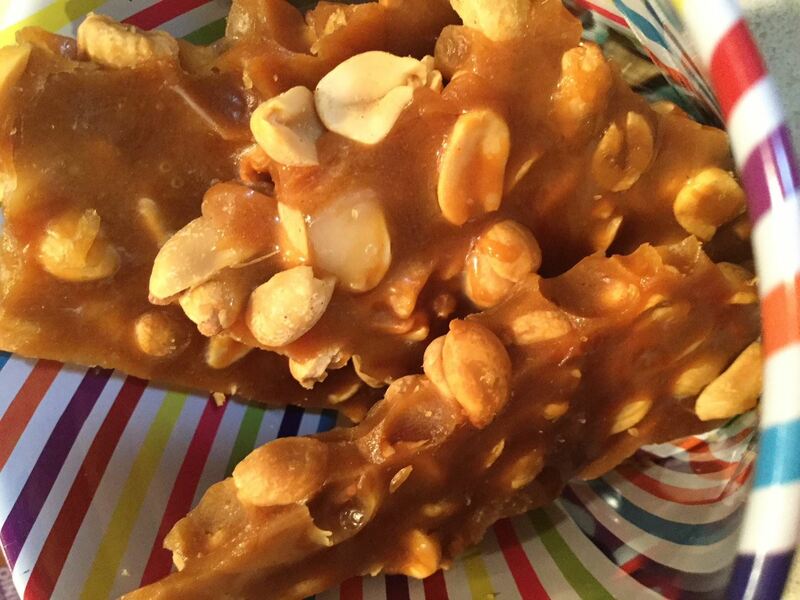 It’s a time of year when we heat up our ovens and whip up countless holiday sweets. 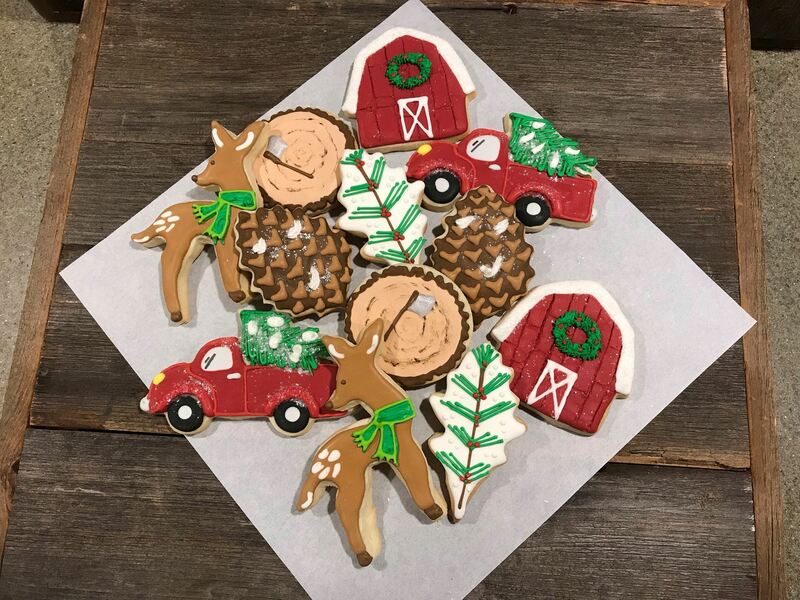 More than just delicious treats, baking Christmas cookies can add a little fun and a whole lot of memories! 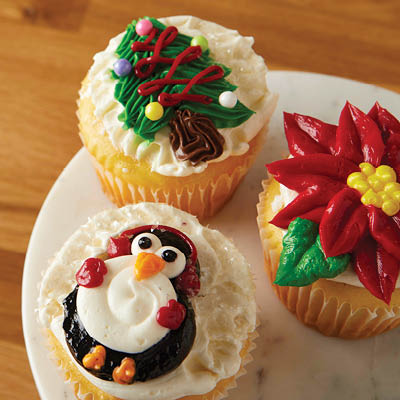 They’re a favorite for families of all ages to decorate. 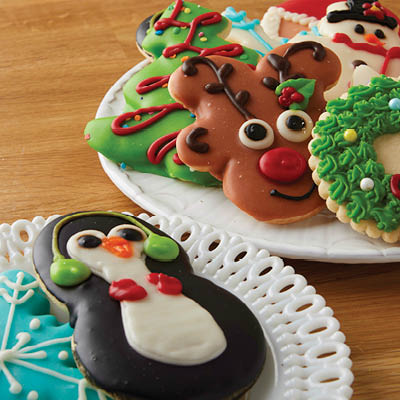 Everyone loves mixing the dough, using cookie cutters to cut the dough into different shapes, and of course the best part - decorating them with colorful frostings and sprinkles or dipping them in chocolate! Cookie were most likely created by accident. 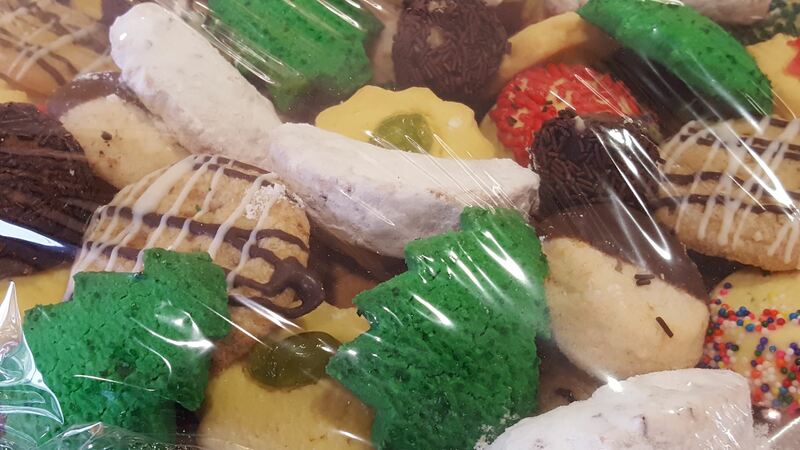 Historians think the idea of cookies was conceived by a Middle Eastern baker way back during the seventh century. The baker didn’t want to waste ingredients so he decided to sell the small batter cakes he used to test the temperature of his cooking oven. The ingenious idea used to eliminate waste by selling these tasty mini-cakes caught on and a revolutionary sugar-based creation was born. It’s very likely that some of the first cookies weren't decorated with sprinkles and frosting or decorated at all. In fact, some of the first cookie recipes that came about in 17th century Europe required the baker to boil the dough before baking it. The dough was rolled, cut into narrow strips and tied in a knot before being boiled and baked. The result was a cross between the modern bagel and a cookie. 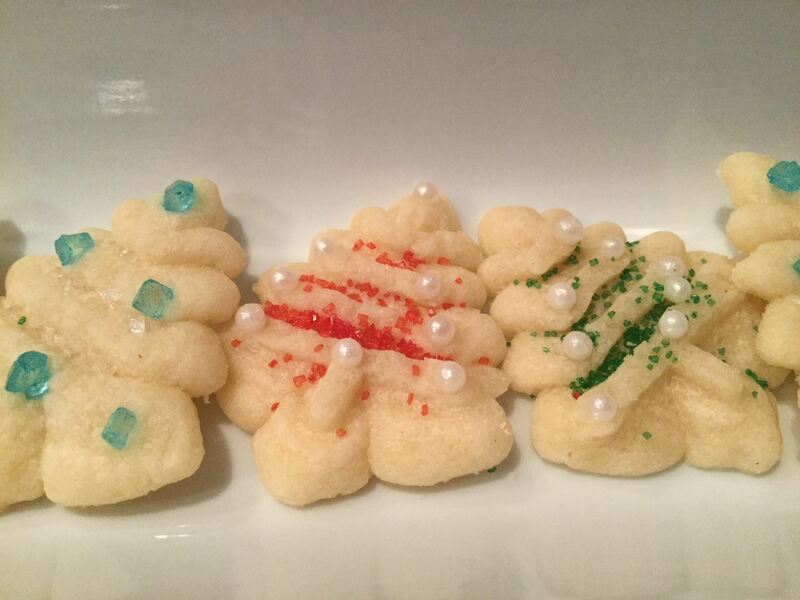 The sugar cookie can be traced back to the mid-18th century in Nazareth, Pennsylvania. German Protestant settlers created the round, buttery cookie and it became known as the Nazareth Sugar Cookie. 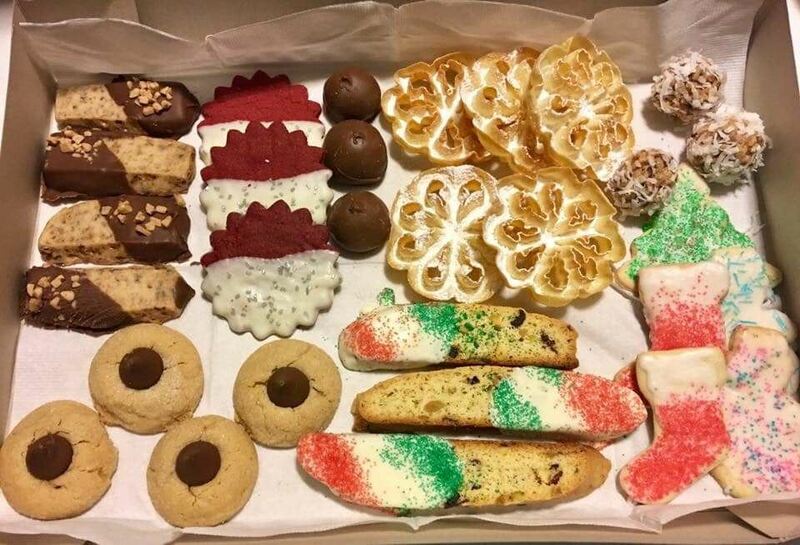 To preserve its heritage as the birthplace of the modern sugar cookie, the Nazareth Sugar Cookies was adopted as Pennsylvania's official cookie through a House bill introduced in 2001. It’s safe to say Nazareth is very proud of their cookies. The cookie cutter was invented in 1875 to help make cutting complicated shapes easier! The tradition of leaving milk and cookies for Santa can be traced back to the Great Depression in the 1930s! American parents at the time tried to teach their children the importance of being kind and charitable. This tradition is still around today and many kids also remember Santa’s reindeer by leaving carrots for them, too! 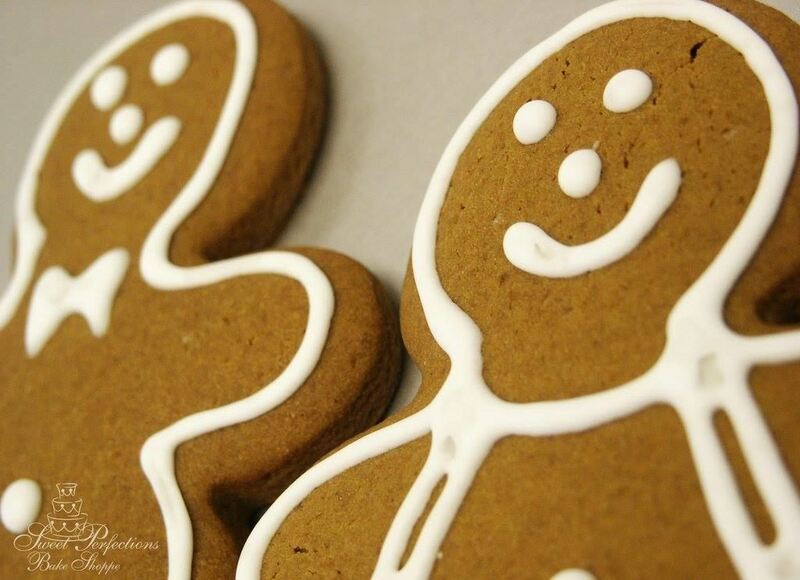 Gingerbread is a type of baked good that is typically flavored with ginger, cloves, nutmeg or cinnamon and sweetened with honey, sugar or molasses to create a yummy, spiced treat. Gingerbread can vary from a soft, moist loaf cake to something close to a ginger snap. Gingerbread is used to construct the walls and roof of the “gingerbread house” and then royal icing is added to create the illusion of snow. Houses are then decorated with various types of candies to complete the look. 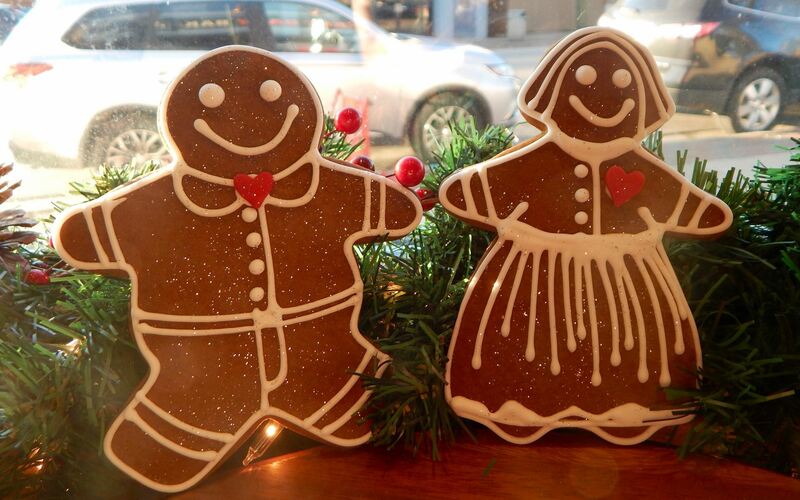 But how did the tradition of Gingerbread come about? Ginger root first appeared in ancient Asia, but the Crusades or the 11th allowed the root to be brought to Europe. Ginger was thought to have medicinal properties and was used to disguise the taste of preserved meats. During Medieval times, ginger cookies became a favorite in many parts of the continent, including France, Holland and England. The cookies were often cut into various shapes, decorated with gold leaf, and displayed at fairs. Gingerbread houses were first created in Germany during the 16th century. Nuremberg was recognized as the "Gingerbread Capital of the World" and master bakers and skilled workers were employed to create complicated works of art from gingerbread. However, they didn’t become popular until the Brothers Grimm published the story of Hansel and Gretel in 1812. 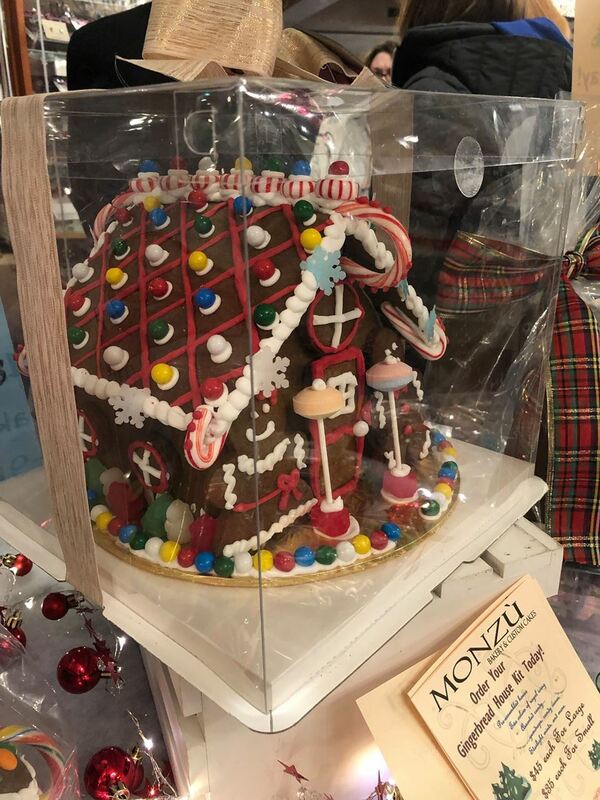 The tale of children stumbling upon a house made of sweets was adopted by people who wanted to recreate the delicious-sounding house while also making it more festive and merry, instead of creepy. Also thanks to the popular children’s story, the idea of making gingerbread houses spread to the United States. 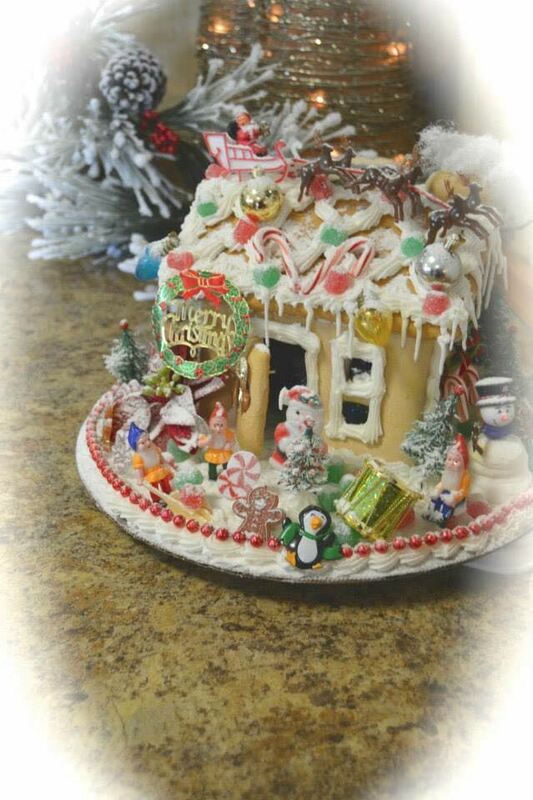 Fun fact time: the world’s largest gingerbread house was built in 2013 at the Traditions Golf Club in Bryan, Texas. The house required a building permit and used 4,000 gingerbread bricks during its construction. The delectable structure is 60 feet by 42 feet and measures up to 20 feet tall. Starting with a wood base, it took 1,800 pounds of butter, 7,200 eggs, 3,000 pounds of sugar, 7,200 pounds of flour and over 200 volunteers to become the tasty, record-breaking reality it is today. But what’s a gingerbread house without some decoration? More than 22,000 pieces were added to the house’s facade after construction to provide the final, yummy touch. 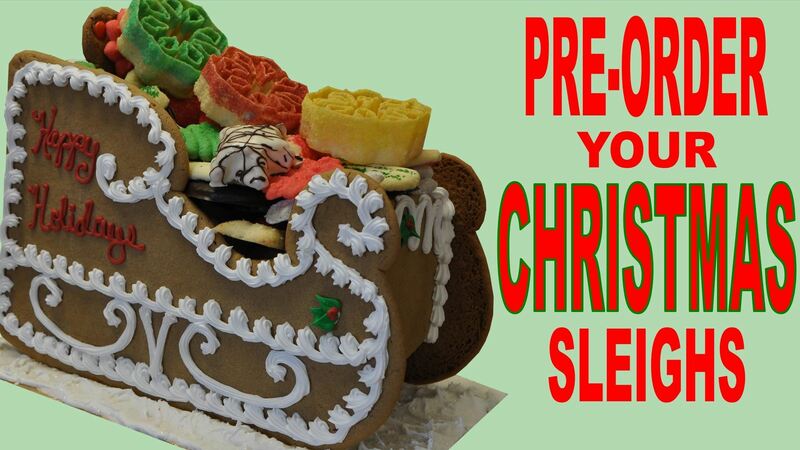 So, whether you’re a beginner or a gingerbread expert, everyone can enjoy this holiday tradition! 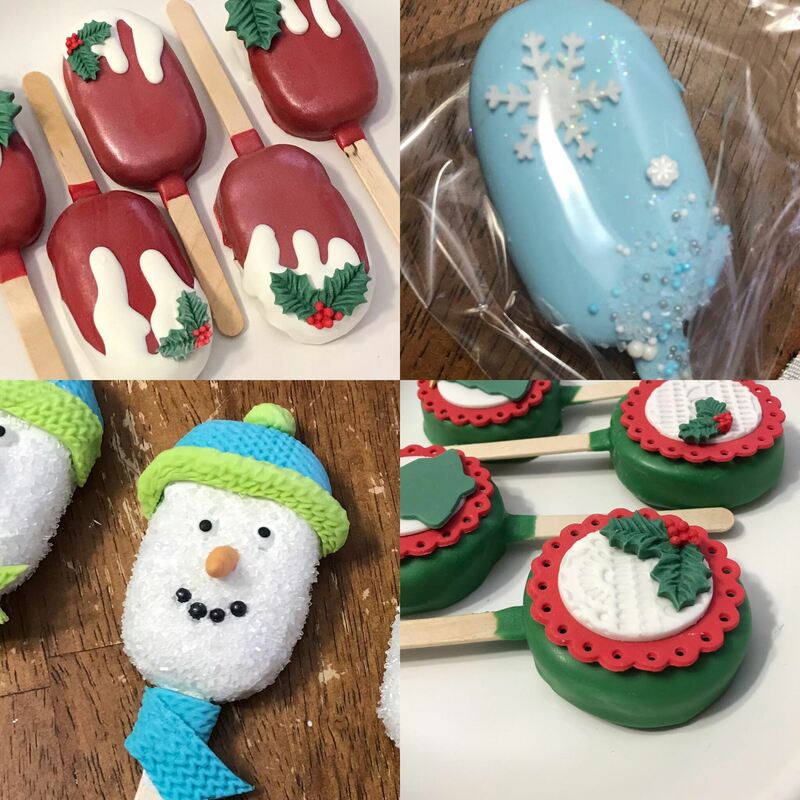 Fun to make, fun to eat; decorating gingerbread men (and ladies!) or creating a unique gingerbread house is the perfect activity for the whole family! 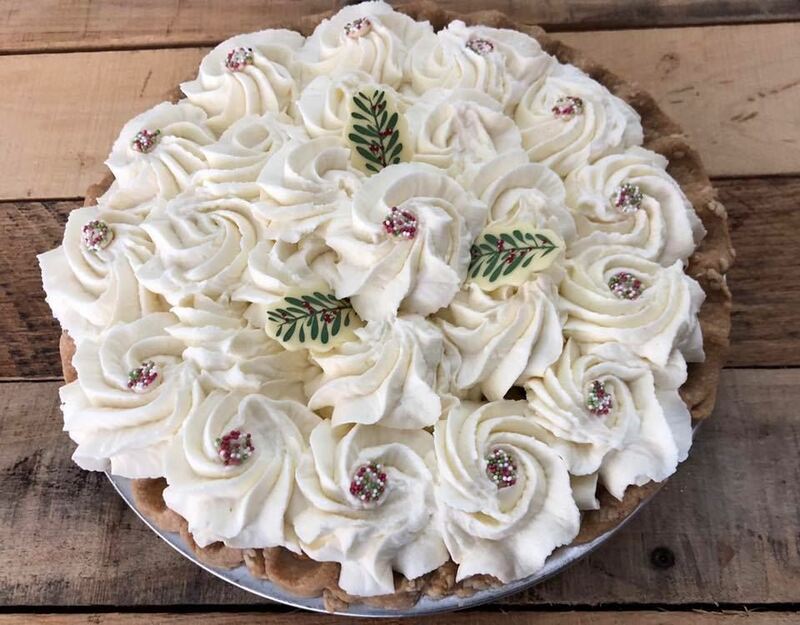 we are featuring Holiday Pies! 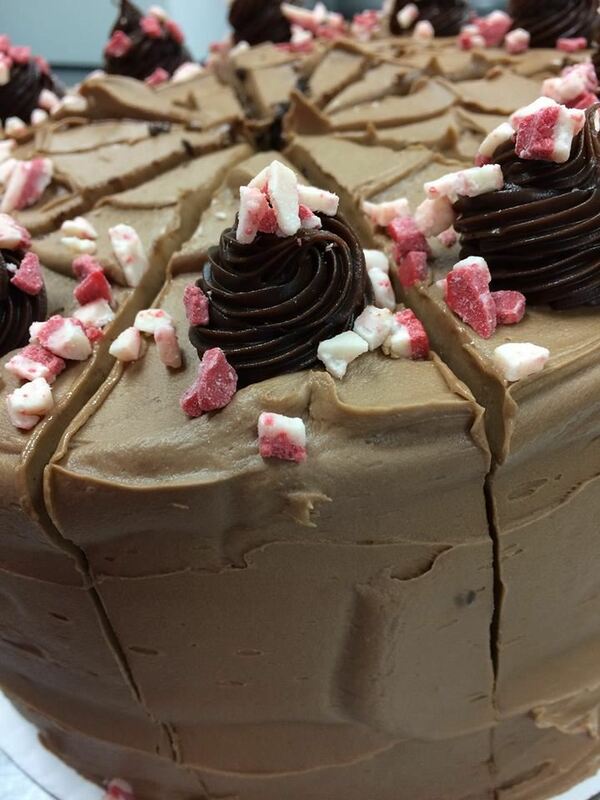 Sweeten your holidays with a holiday pie – chocolate, pecan, apple, pumpkin, eggnog, cranberry - the flavors are endless! While pie is considered a year-round treat, pie will be a festive change of pace on the holiday dessert table. Early pie recipes were a lot different from what we have today, as they rarely called for sugar, because sugar was too expensive and rarely available to the masses at the time. In the New World, pies were flourishing. In addition to pies being a delicious treat, settlers also had practical reasons for making them. Pies used less flour than bread and could be easily and cheaply baked. They also provided a sustainable food source that could be rationed out to hungry immigrants. Pie continued to sustain early settlers as they expanded to the west. Once pioneers found land to claim as their own, their pies began to reflect the regional differences of the areas where they settled. Pumpkin pies and pies sweetened with maple syrup were enjoyed in northern states. “Chess pie” was popular in the South—a silky pie with a rich filling of sugar, buttermilk, and egg. Settlers in Florida, utilizing the local citrus, turned native limes into key lime pie. The Midwest, famous for its dairy farms, favored cheese and cream pies. But apple was the most plentiful fruit of all, and in almost every part of the country, (especially the Midwest and the Northeast), apple were baked into their pies. However, during the mid-1800’s, the pie craze in America cooled off. Early concerns for nutrition and women joining the work force contributed to the decline. But pies never disappeared completely, and after World War II they rebounded. Modern food advances and technology made pie making easier with the advent of ready-made crusts and box mixes. 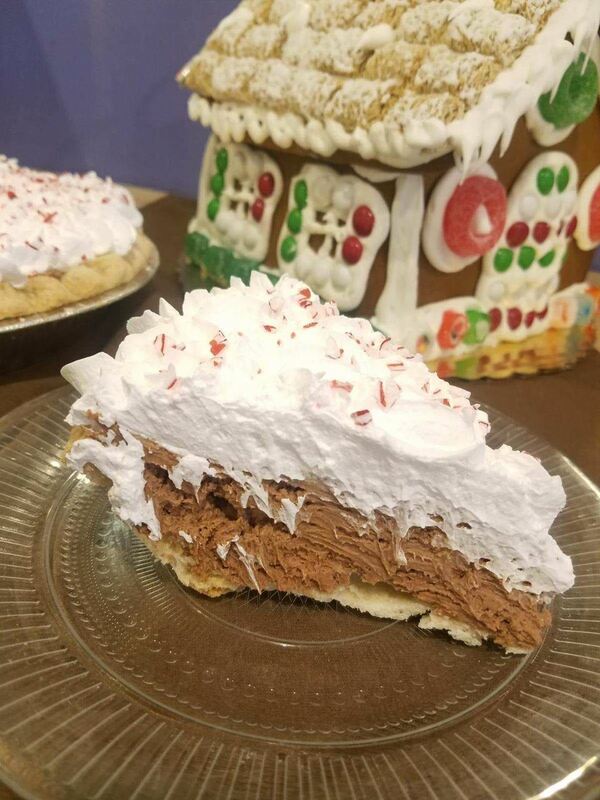 So, mix up your pie routine this holiday season and add something rich and luscious, creamy or sweet, and trust us, your friends and family will thank you for it! Remember – holiday pies are packed with Santa-approved flavors like cherry, chocolate, and even eggnog.